Hello and welcome to VOA Learning English. Most of us here in the United States are celebrating the coming of a New Year. At the stroke of midnight on January 1, we rang in 2018! Many cultures follow different calendars and celebrate the New Year at different times. The Lunar New Year is one example. No matter when you celebrate, there are many traditions around the world for ringing in the New Year. Many cultures have traditions meant to scare off demons and bad luck. This often involves using fire or loud noises – or both – often in the form of fireworks! But there are other ways people do it, too. In Scotland, for example, people hold bonfire celebrations. And men from villages walk through the streets swinging giant blazing fireballs over their heads. These fireballs represent the sun and they are supposed to clean the coming year. In Panama, people use bonfires to burn likenesses of popular celebrities and political figures. These doll-like effigies represent the old year. Burning them brings a fresh start for the New Year. Of course, some traditions meant to avoid bad luck do not involve fire at all. For example, just before the New Year, people in Denmark find the highest surface they can and jump from it as the New Year starts. This is so they can jump into January! The hope is that they leave behind the bad spirits and bad luck of the previous and enter a New Year full of promise and new beginnings. Some Finnish people like to drop molten tin into cold water. Then they look at the shape and try to figure out meaning from it. For example, if it looks like a train, perhaps the New Year will bring travel. If it looks similar to a heart, perhaps it means the New Year will be filled love and romance! Many cultures have certain foods that are said to bring good luck. In the southern part of the United States, people often eat black-eyed peas and pork for good luck in the New Year. In other parts of the U.S., people eat sauerkraut with pork sausage on New Year’s Day. In Spain and some other countries, as the clock strikes midnight, people eat 12 grapes. These 12 grapes represent the 12 months of the year. And eating them all in the first 12 seconds of the New Year guarantees that the year will be filled with good luck. In the Philippines, many people eat and display 12 round fruits to bring them a prosperous year. And in Japan, people eat soba noodles on New Year’s Eve. While they eat they try not to break the long noodles -- which represent longevity. To start the New Year off on the right foot, many people like to wear new clothing. But some traditions take it a step farther than that. In Japan, for example, people who believe in Buddhism may dress up like the zodiac animal for the coming year. Then they go to a temple to, literally, ring in the New Year. At Buddhist temples, monks will ring a bell 108 times, one for each humanly sin. 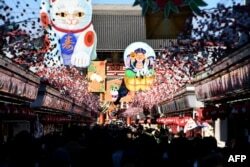 Visitors walk underneath New Year's Day decorations celebrating next year's "Year of the Dog" from the Chinese zodiac at the Nakamise shopping alley, the front approach to Sensoji Temple, in Tokyo, 2017. In Romania, there is a tradition that involves dressing up in a bear costume and going from house to house. If this won’t scare off evil spirits, I don’t know what will! 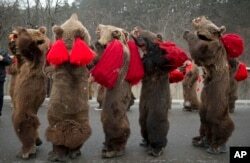 People wearing bear furs perform during a festival of New Year ritual dances attended by hundreds in Comanesti, northern Romania, Wednesday, Dec. 30 2015. People in the Philippines may wear clothing with circular design, or polka dots. The circles represent coins, which stand for wealth in the New Year. In Brazil, Ecuador, Bolivia and Venezuela, some people wear colorful underwear on New Year’s Eve. The most popular colors are red and yellow. Red is supposed to bring you love; yellow is supposed to bring you money. Turkish people are also said to wear red underwear clothing for good luck. 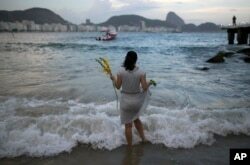 A woman offers flowers to Yemanja, goddess of the sea, for good luck in the coming year during New Year's Eve festivities on Copacabana beach in Rio de Janeiro, Brazil, Dec. 31, 2016. Many use the start of New Year as a time to try something new or change something about themselves. The New Year is a perfect time to turn over a new leaf, or to change yourself for the better. That is why many people have the tradition of making a New Year’s Resolution. They are usually about living healthier or having more success and fulfillment in life. In the New Year, you can wipe the slate clean. This means you can simply wipe away all the mistakes you made from the previous year as you would chalk on a slate board. Or maybe your life is just as you’d like it. As we say, if it ain’t broke, don’t fix it! No matter how you celebrate, all of us here at Learning English wish you a very happy, healthy and prosperous 2018! These are just a handful of traditions. Tell us about a New Year’s tradition in your culture in the comments section! Anna Matteo wrote this story using several websites to gather this collection of New Year’s traditions from around the world, including The Old Farmer’s Almanac and Travel & Leisure. Ashley Thompson was the editor. stroke of midnight - expression to describe the exact moment of time change from one day to the next.